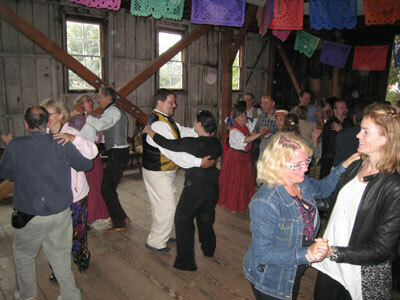 Attendees learn traditional California dances at the Festive Fandango. Bio of Keynote Speaker Luis Valdez: Click HERE. Archived Conference Information Page: Click HERE. This August, IMTAL welcomed over sixty participants to its 6th Biennial Global Conference in Monterey, CA. Hosted by the Monterey Bay Aquarium, presenters from Sweden, Australia, Canada, the UK, and all over the US presented sessions and workshops related to all aspects and areas of museum theatre. The conference theme was “On the Edge,” which can be interpreted on many levels. First geographically, in that the meeting took place on the western edge of the North American continent (or the eastern edge of the Pacific Plate). Secondly, as forward-thinking professionals we hope to continually be on the cutting-edge of our field. In finding solutions to problems, we may occasionally have to edge around established institutional protocols. And because theatre is such an effective tool in museum interpretation and education, we simply may want to revel in the edge we maintain over traditional, static exhibitions and programming! The keynote speaker of the event was Luis Valdez, renowned playwright and Founder/Artistic Director of El Teatro Campesino, a theater of farm workers in California that inspired young Mexican-American activists across the country to use the stage to give voice to history, myths and present-day concerns. In his inspiring speech, he reminded us of the power of theatre to transform lives, both inside and outside of a museum. Attendees who participated in the field trip the following day were treated to a home-cooked dinner at El Teatro Campesino’s facility in San Juan Bautista, as well as a performance of La Carpa De Los Rasquachis (“The Tent of the Underdogs,”) a non-stop, high-energy, musical telling of the experiences of an immigrant farm worker in the US. The sessions covered a huge variety of topics, including research results, innovative performances, training methods, creative dramatics, oral history, improvisation, lighting, strategies for working with communities, and everything in between. For the first afternoon, the attendees traveled down Cannery Row to the Monterey History and Maritime Museum and Heritage Harbor at Fisherman’s Wharf, which provided an opportunity to see and learn about Monterey as a place. After sessions were over, the nearby Cooper Molera Adobe presented an original performance and hosted a Festive Fandango in the barn where volunteers taught the attendees traditional California dances. The field trip day started out at the Steinbeck Center in Salinas, CA where attendees explored the exhibits, learned about the museum’s programs, and were visited by John Steinbeck himself (played by the very talented historian performer Taelen Thomas.) After a lunch break, attendees toured Historic San Juan Bautista’s mission church, Plaza Hotel, and other historic buildings with first and third person interpreters. A few lucky attendees had the opportunity to view the upstairs of the Castro-Breen Adobe (where only nine people are allowed at a time, due to safety weight restrictions) or meet up with the homesteaders in the rustic cabin who told you about their journey along the Oregon trail and then on to California. The Monterey Bay Aquarium and its staff were gracious and exciting hosts, providing a breathtakingly gorgeous backdrop for the discussions and conversations. Attendees had opportunities to see the Aquarium’s museum theatre performances (including Watt A Waste!, ¡Basta Basura! Enough Trash!, Seahorse Magic, and The Real Cost Café) and animal shows, and included us on the surprise when a great white shark was introduced into the Aquarium’s large Outer Bay tank in the middle of our conference. Right outside the Aquarium attendees observed wild sea otters, seals, sea lions, and many species of birds. On the final evening of the conference the Aquarium hosted a gala dinner where attendees feasted and danced by the Kelp Forest tank. Special thanks also go out to the two conference sponsors, Cortina Productions and GAM Lighting Products. Before the conference ended, attendees were already getting excited about the next planned gatherings of museum theatre professionals: first in St Louis, Missouri in August of 2010 and then in Melbourne, Australia in October of 2011. Be sure to check the IMTAL web site for more information about the Monterey conference and all upcoming events.